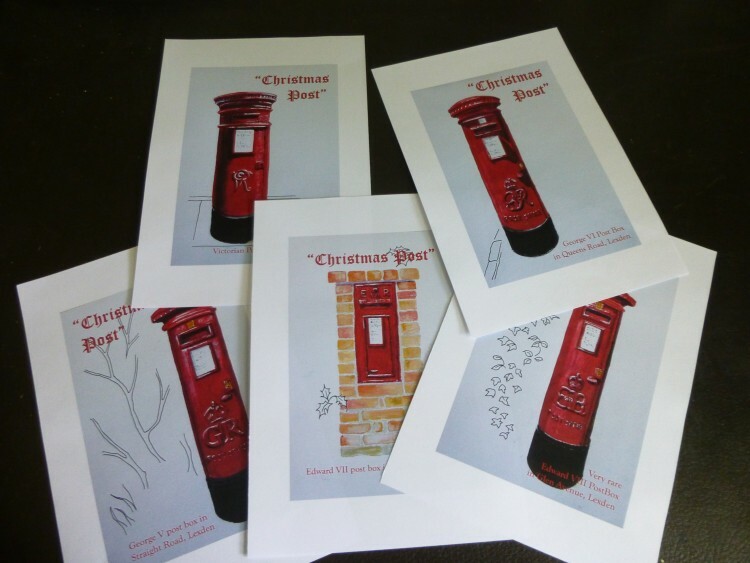 So – I’ve finished the five little paintings for my Christmas Card idea that I mentioned a few posts ago! Originally I was going to wait until it snowed last winter and paint a few snow scenes . . . . . we hardly had a flake! Then I had the Christmas Post idea, but to start with it was only going to be the Edward VII post box in my road. And then one morning I was stuck in a traffic jam in Straight Road in Lexden, and noticed that there is a post box there dating from George V’s reign. I started to get intrigued. Walking down Glen Avenue to deliver something to a friend really clinched it though – there is a very rare Edward VIII post box! Googling it, I discovered there is only one other in the whole of East Anglia from the time of this un-crowned King, before the abdication. So then I searched out a George VI box in Queens Road, and a Victorian box in Lexden Road, which made up the full set of ‘Historic Post Boxes of Lexden’! They each have the monarch’s cipher on the front, each one displaying a different style of lettering. I photographed all the post boxes, painted the little pictures, photographed the paintings and added the text, and now the images are all ready to have printed in time for my Open Studios at the end of September. (In the photo above, the images have a wide white border which won’t be there on the real cards.) I will be selling them in packs of five, one of each design. I don’t suppose anyone outside Lexden will be interested in them, but I am really pleased with how they have turned out! When I took my four paintings over to the Hayletts Gallery on Tuesday, I had a walk by the Blackwater at Heybridge Basin, and found quite a few good dinghies. I am just finishing painting ‘From my July Garden’ today (should be up here by tomorrow all being well) and then it will be on with another in the dinghy series. 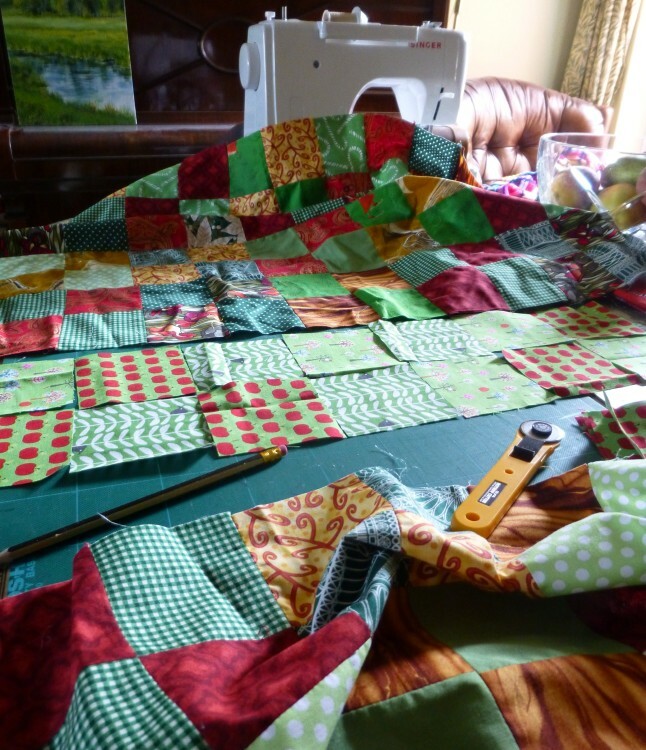 In the meantime, I am trying to finish the last bit of the pieced top of a patchwork table cover I’m making. I went to a lovely shop called Fabric Rehab, just outside Dedham, a few weeks ago with a friend, and we both came out with far more than we had intended! I got some lovely ‘fat quarters’ to finish the centre band of the patchwork. I’ve completed the main part, which is four large rectangles made up of 8cm squares put together in fours. Now I just need to complete the cross shaped strip which will connect them up. Fabric Rehab have a great website, but going in person is even better. If you are local to the Colchester area, it is just up the Manningtree Road leading out of Dedham. I am aware that there is a fault on the site at present – if you scroll down the three latest posts and then click the back button to read older posts it comes up as page not found. Don’t worry, we’re on the case! In the meantime, use the Archive button for July 2015 to read previous posts.